Led by Arthur S. Edison, Ph.D., and Richard A. Yost, Ph.D., a multidisciplinary team of metabolomics experts from the University of Florida and partner institutions received a five-year, $9 million grant from the National Institutes of Health to launch the Southeast Center for Integrated Metabolomics as part of the UF CTSI. 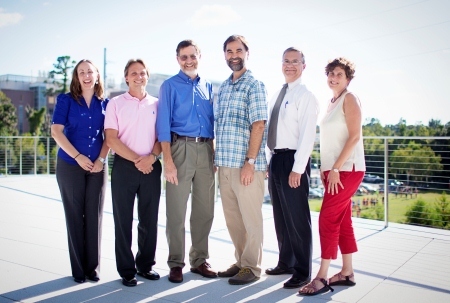 Members of the UF team pictured above (left to right): Alicia Turner; Timothy J. Garrett, Ph.D.; Richard A. Yost, Ph.D.; Arthur S. Edison, Ph.D.; Michael Conlon, Ph.D.; and Lauren M. McIntyre, Ph.D.
To help chart the course of biomedical discovery in the newest of the “-omics” frontiers, the University of Florida today launched the Southeast Center for Integrated Metabolomics with a five-year, $9 million grant from the National Institutes of Health. An emerging field, metabolomics is the study of small molecules called metabolites, which result from the metabolic processes that fuel and sustain life. It offers a new lens through which scientists can assess and understand the state of nutrition, infection, health or disease in an organism, whether human, animal, plant or microbe. With the new grant, UF’s Southeast Center for Integrated Metabolomics joins a pioneering consortium of five other regional resource centers and a national coordinating center supported by the NIH Common Fund, which in 2011 established a program to spur metabolomics research in the United States by funding training, technology development, standards synthesis and data-sharing initiatives. Ripe for the kinds of discoveries that have been emanating over the last decade from its sister fields of genomics and proteomics, metabolomics draws from many scientific disciplines, including chemistry, physiology, statistics, genetics, computer science and systems design. Part of the UF Clinical and Translational Science Institute, or CTSI, the Southeast Center for Integrated Metabolomics brings together expertise and resources from multiple colleges and units at UF as well as Sanford-Burnham Medical Research Institute, the National High Magnetic Field Laboratory at Florida State University, Ohio State University, the University of Georgia, Imperial College London, the University of Geneva and industry partners IROA Technologies and Thermo Fisher Scientific. “This is an exciting expansion of the CTSI and its resources for translational research, which allow us to improve health through discovery and are a key part of UF Health’s strategic plan,” said David S. Guzick, M.D., Ph.D., senior vice president for health affairs and president of UF Health. “Sanford-Burnham is thrilled to partner with the University of Florida leading to the establishment of the Southeast Center for Integrated Metabolomics, our first formal research collaboration with UF. Consolidation of our complementary expertise in metabolite profiling creates a solid foundation for this new regional center of excellence formetabolomics research. The center will benefit scientists throughout Florida, the nation, and the world — and serve to showcase Florida’s growing strength in biomedical research,” said Stephen Gardell, Ph.D., senior director for scientific resources and an associate professor at Sanford-Burnham. The services and resources of the Southeast Center for Integrated Metabolomics will be available to basic and clinical scientists across the country, with outreach targeted to those in the Southeast. The center will integrate existing and emerging technologies in new ways to improve the quality and interpretation of metabolomics data. “Our labs have a history of being highly entrepreneurial when it comes to developing new instrumentation and techniques that improve how we generate and visualize metabolomics data, and we look forward to building on that spirit of innovation with our partners and collaborators,” said Richard A. Yost, Ph.D., co-principal investigator and co-director for the center and a professor and head of analytical chemistry in the UF College of Liberal Arts and Sciences. The Southeast Center for Integrated Metabolomics has four closely integrated technical cores: Mass Spectrometry Services for high-throughput global and targeted metabolomics, co-led by Gardell at Sanford-Burnham and Timothy J. Garrett, Ph.D., at UF; Nuclear Magnetic Resonance for global metabolomics and biomarker identification, co-led by Edison and Glenn A. Walter, Ph.D., at UF; Advanced Mass Spectrometry for biomarker identification, imaging mass spectrometry and isotopic ratio outlier analysis, led by Yost; and Bioinformatics for quality control, data standardization and analytical tools, led by Lauren M. McIntyre, Ph.D., at UF. Michael Conlon, Ph.D., at UF and Steven Smith, M.D., at Sanford-Burnham co-lead the center’s Promotion & Outreach Core, which will offer training and pilot funding to help scientists access and use the center’s services. “Metabolomics has the potential to unlock new biological clues that can improve how we diagnose and treat diseases, particularly those known to have metabolic origins such as diabetes. This novel collaboration will help accelerate our ability to translate basic metabolomics discoveries into clinical applications,” said David R. Nelson, M.D., assistant vice president for collaborative research in the life sciences and director of the UF CTSI. The center will partner with the UF High Performance Computing Center to power its data processing and storage needs. Significant matching funds for the center’s operations have been committed by the university’s Office of Research, CTSI, College of Medicine, College of Liberal Arts and Sciences, and Institute of Food and Agricultural Sciences. “The Southeast Center for Integrated Metabolomics exemplifies what’s possible at UF when we seed our research environment with world-class infrastructure — it provides fertile ground on which our faculty can collaborate and advance science in visionary ways,” said David P. Norton, Ph.D., UF’s vice president for research. The Southeast Center for Integrated Metabolomics is supported by the NIH Common Fund under award number U24DK097209, and it builds on infrastructure created with funding from UF and the NIH National Center for Advancing Translational Sciences under award number UL1TR000064. For more information about the Southeast Center for Integrated Metabolomics, visit www.secim.ufl.edu. For media inquiries call Claire Baralt at 352-273-8211 or email cbaralt@ufl.edu.